Take control of the lighting in your stills and HD videos. As you master your camera, you begin to look at lighting in an entirely new way. No longer is proper exposure your only goal—now you can use shadows and brightness to add a sense of depth, an artistic characteristic to your photos and HD videos. 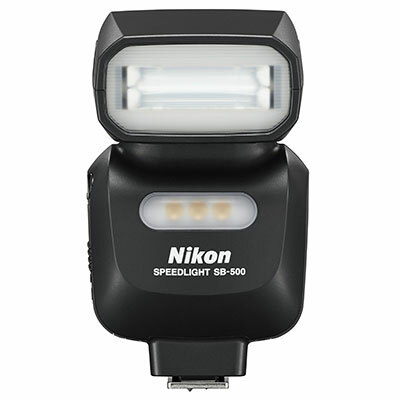 A first for Nikon Speedlights, the SB-500 AF Speedlight is a compact, lightweight i-TTL Speedlight and LED video light that gives you total control of the light around you. Whether you're looking for extra illumination during HD video recording, a wireless off-camera flash to use along with your camera's built-in commander mode, another Nikon Speedlight like the SB-700 or SB-910 or the SU-800 Wireless Speedlight Commander or just an advanced and versatile—yet simple to use—Nikon Speedlight, the SB-500 AF Speedlight is a bright idea.